Earlier this month the Eastern Hillsborough Art Guild (EHAG) held its Annual Christmas show called A Christmas Showing of Fine Arts. This year, the event was held at the Plant City Entertainment (PCE) Theatre located at 101 N. Thomas St. in Plant City. This is the first time that EHAG and PCE have collaborated in this way. 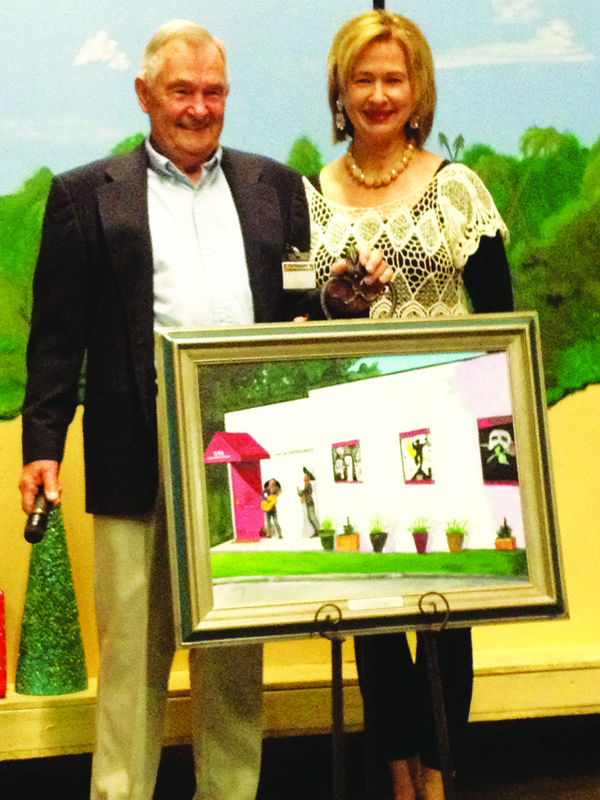 As a commemoration of this momentous collaboration, Richard Wagner, president of EHAG and an accomplished painter, created an acrylic painting of the Plant City Entertainment building and presented it to Marsha Passmore, president of Plant City Entertainment’s Board. “I wanted to give something significant to PCE and could not think of anything better than a painting of their theatre,” Wagner said. PCE has been providing outstanding community theatre experience since 1980. In fact, it is one of the longest running community theatres in the state of Florida. “The partnership PCE has with EHAG, as well as the Arts Council of Plant City, creates a bond with like-minded people that appreciate all forms of art,” Passemore said. EHAG was established in 1992 with a mission that includes promoting the enjoyment of visual arts, enabling members to publicly show and sell their art, actively participating in community events and giving support and encouragement to both professional and emerging artists. At A Christmas Showing of Fine Arts, over 300 residents attended. They were treated to food and entertainment by pianist Nancy Driscoll, who delighted everyone with holiday tunes. A total of 38 members from EHAG showcased 98 works of art. “We are very grateful to Plant City Entertainment for their generosity in allowing us the use of their building. I encourage everyone to attend at least one of their productions this year. This could be the beginning of a beautiful reciprocal relationship between the visual arts and performing arts in Plant City,” Bryant said. PCE will perform Broadway Bound this February. For a complete list of all of their upcoming shows and performances, visit www.pceshows.com. EHAG will be busy preparing for the annual Annual Strawberry Festival Fine Arts Show. For more information on the upcoming Strawberry Festival Fine Arts Show, visit www.ehabfinearts.com.